The Super Bowl ended months ago, spring football is done, and the draft has been held. However, there is still football being played, although very few people are aware of it. The football I refer to is being played by women in various leagues. I am most familiar with the teams of the Women’s Football Alliance, which began play in April, and has recently started its playoffs. I have been able to attend three games this year. I saw the Columbus Comets trounce the Derby City Dynamite 59-6 on April 8. 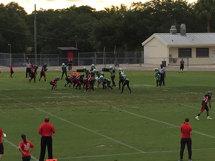 My next game was watching the Tampa Bay Inferno crush the Orlando Anarchy 52-3 while reading APUSH exams on June 3. The most competitive game happened on June 17, when I saw the Thee Toledo Reign defeat the Main Mayhem 22-6 in the first round of the Division III playoffs. I had previously watched women’s football in France, and wrote up that experience last summer. In that game, the Molosses (Bulldogs) of Asnieres-sur-Seine defeated the Argocanes of Aix-en-Provence 24-0 in the final of the French National Challenge Féminin. It was a nice introduction to the women’s game, and the game was closer than the score indicated. The Molosses only pulled away in the second half after the Argocanes ran out of gas (and players). My first American women’s football game pitted the Comets against the Dynamite. A crowd of maybe two hundred fans gathered at the Huffaker Community Sport Complex in Columbus to cheer on the home team. The Dynamite were out-womaned by the Comets who had at least twice the number of players. This problem was exacerbated by several injuries to the visitors. The hitting was crisp, and much to the delight of the crowd, the Comets marched down the field at will running up fifty nine points before they were through. The injuries, one of which required a player to be taken away by ambulance, slowed down the game, and I had to leave at halftime to get home to Ada, which is around an hour and a half north of the capital. Still, I enjoyed the game. I did see something I had never seen before in a football game. After the Comets scored their first touchdown, Amanda Herbst, the starting quarterback and holder for the PAT, knelt to take the snap. Before the ball was hiked, she threw up. She ran to the sideline, and after taking a brief break, played the rest of the game, so maybe it was early game jitters, as one of the sideline players asked her as she ran off the field. I’ve tried to combine conferences with games, but sometimes that hasn’t worked out very well. On April 22, I had planned to watch the Indy Crash play the Chicago Force after attending the National Council on Public History to watch a panel organized by Andrew McGregor. The panel was great, but the Crash had to forfeit their game to the Force after suffering a number of injuries. Fortunately, I was able to establish contact with Lesley Neff of the Crash, and she helped me set up interviews with April Priest, the head coach/owner of the team, and with Lea Kaszas, one of their players. Those interviews joined my first interview with Leah Hinkle of the Portland Fighting Shockwave, and my research efforts began to pick up steam. Likewise, I had hoped to combine the recent NASSH conference with a chance to see the Los Angeles Warriors play the Kern County Crusaders, but Kern County had to forfeit. I have made contact with their owner, but haven’t been able to do any interviews yet. Fortunately, we had Katie Taylor presenting on the history of women’s football, and I was able to interview her about her experiences with women’s football in the UK. She also put me in touch with Andrew Gambrill, the head of women’s flag football in England, and we are working on doing more interviews soon. Fortunately, during the APUSH reading in Tampa, I was able to watch the Inferno play the Anarchy, which helped keep me sane in the midst of the brutal eight hour days reading student essays. The Anarchy had recently suffered a tragedy when Jahqui Sevilla, one of their players who had survived the Pulse Orlando shooting, was killed in a car accident on May 29. The Pulse shootings had taken the life of assistant coach Cory Connell, and had wounded defensive back Paula Blanco. The Inferno held a moment of silence to remember Sevilla prior to the game. The Anarchy started strong, and drove the ball deep into Inferno territory before the defense stiffened, and held the visitors to a field goal. The Anarchy had a good passing attack, but the Inferno ground attack began to roll over them. Running backs Candi Thompson and Tynequia Roberts scored two touchdowns apiece, including an 86 yard run for a score by Roberts. Marcelina Chavez added another rushing touchdown while quarterback Kim Shaw passed for two scores to Dominique Jacobs and Candace Brady. Brady added the PATs and also kicked first quarter field goal. A crowd of around three hundred turned out for the game at Hillsborough High School, and the fans were loud in their support for the home team. As impressive as their win was – it capped their second consecutive undefeated regular season – perhaps more impressive was that the Inferno was featured on local television news. Women’s tackle football teams and players toil in anonymity for the most part, rarely receiving any recognition other than what they provide for themselves on social media. So the two stories that ran locally were a press bonanza. Team owner Jennifer Moody, along with safety Jennifer Marshall, OL Chrissy Clingan, DL Ty Baldwin, and DL Corynn Franklin also had a less normal interview opportunity during the week when a historian (me) visited their Wednesday practice. Moody, who had played for the Pittsburgh Passion before relocating to Tampa, was very welcoming and accommodating in bringing the players to talk to me about their football experiences during a busy practice session. Those interviews are also on the same page as those mentioned above. The brief takeaway from those interviews was that the women saw their team as a family and the game as a way for continuing to compete in an intense sport as an adult. Their stories and the others that I have collected so far are well worth a listen. 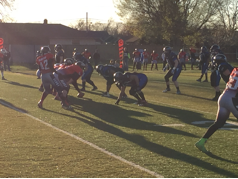 Safely back at home, at least for a couple of weeks, the next stop on the WFA tour was the first round of the WFA Tier 3 playoffs that featured the Reign against the Mayhem. A crowd of maybe one hundred and fifty or so turned out for the game at Don Paul Stadium in Fremont, Ohio, which is forty miles southeast of Toledo (and also the home of the Rutherford B. Hayes Presidential Center). Toledo opened the scoring when Briana Patman ran the ball in from 22 yards out. The Mayhem was moving the ball when Reign LB Marabeth Lewis intercepted Mayhem QB Theresa Hendrix and returned it to the 9 yard line. From there, Patman ran it in for the second Reign touchdown. A busted PAT play resulted in the Reign converting a 2 point conversion. After Maine scored to make it 15-7, the Reign answered when RB Octavia Griswold scored from the 5 yard line to finish the scoring, and seal a 22-7 victory for the Reign. This was the first playoff victory for the Toledo team, which began play in 2003. The Reign website has the phrase “Home to the Reign and the Birthplace of Women’s Pro Football.” Longtime readers of the blog will likely understand that reference, since they have probably read Andrew Linden’s “American Football and the 1970s Women’s Movement.” One of the first posts on Sport in American History, Linden discussed the Toledo Troopers, a pioneer team with the Women’s Professional Football League, and then the National Women’s Football League, that operated in the 1960s and 1970s. Canton, Ohio is the birthplace of the National Football League, and Toledo can make a plausible claim that they are part of the birthplace of women’s professional football. Illustrative of the difficulty women’s football has in attracting any press attention, when I searched the Toledo Blade for any mention of the game, I found nothing. There was a story on the Toledo Troopers, and one from 2013 about the Toledo Crush, then of the Legends Football League, but the only mention of the Reign was a photo of team members riding motorcycles and marching in the 2016 Toledo Pride parade. The same was true of ABC Channel 13 news, which had stories about a college kicker that may have violated rules by receiving payments from his YouTube videos, but nothing on the Reign. The game was recorded by the Buckeye Cable Sports Network, and is currently being replayed on some Ohio cable carriers, so they may get some notoriety out of that, but getting favorable press for women’s football is a difficult proposition. There are ways that those who wish to watch women’s football can find games steamed online. The Snohomish Times streams the Everett Reign’s football games, and various championship games can be found on YouTube. The WFA partnered with DFTV, a pay service to telecast selected games. As I am finishing this, I am watching the Southern Oregon Lady Gades play the Rocky Mountain Thunderkatz Division III playoff game that I found advertised on Facebook – the Lady Gades won 46-6. 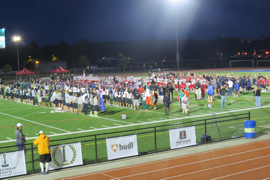 Beginning on June 24, six national teams from Australia, Canada, Finland, Mexico, the UK, and the USA gathered in Langley, British Columbia and vied for the IFAF Women’s World Championship. This will be the third WWC, and the first held outside of Europe. The USA won the first two WWCs by defeating Canada at Stockholm in 2010, and Canada again at Vantaa, Finland in 2013. Finland finished third in both previous championships. In my second stint as a foreign correspondent, of sorts, I attended the WWC this year, and posted on the games last week. In addition, I added nineteen interviews with players from Canada, Finland, Great Britain, and Mexico to my Women Playing American Football page. Football Canada was the local host of the games, and if you were unable to attend, they have recorded streams of the games on their website. Spoiler Alert: If you want to watch the final day of games without knowing the results ahead of time, skip to the next paragraph. The USA and Canada met in the final game, as they had the previous two times the championship has been held. The result was also the same as in previous WWCs – the USA defeated Canada 41-16. The 25 point victory margin was, however, the smallest that Team USA has posted. Mexico defeated Great Britain 19-8 to secure the top three spots for North American teams, and Finland defeated Australia 35-0 to take fifth place. The Americans and Canadians, as might be expected, are demonstrably superior to the rest of the world, but the play of the Mexicans, Finns, British, and Australians gave some indication that the experience level might be evening out across the world. The athletes that participated in the games were exceptional, and the American dominance is more a factor of experience than ability. As more women begin to play across the world, and as exchange networks spread – with North Americans playing in Europe and vice versa, there may be a day when a team from outside the continent will challenge that dominance. If interested, you can read the stories that I supplied to American Football International below in the footnotes. The Columbus Comets and the Indy Crash finished out of the running for the playoffs. The Comets finished with a 4-4 record, and the Crash, in an injury plagued season, finished at 1-7. The Portland Fighting Shockwave posted a 7-1 record, but did not make the playoffs. The San Diego Surge defeated the LA Warriors 51-30. The Mollosses wrapped up their third straight championship of the French Challenge Féminin by defeating the Lions de Bordeaux 34-14. Though they only play for the love of the game, and a few hundred devoted fans, the teams and players of the WFA play the game hard. 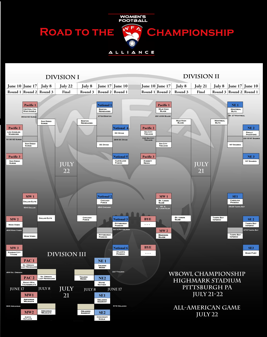 You might visit the WFA website and check your locale for teams. If you are in the Pittsburgh area, the WBowl, which features the championship games for each of the three divisions, will be held at Highmark Stadium on July 21 and 22. So if you are ready for some football, and can’t wait for the NFL preseason, you are in luck! Russ Crawford is Associate Professor of History at Ohio Northern University in Ada, Ohio. His area of specialty is sport history, and his current project is a history of women playing football. Along with several chapters on sport history, he has published two books. Le Football: The History of American Football in France was recently published by the University of Nebraska Press in August of 2016. His first book, The Use of Sport to Promote the American Way of Life During the Cold War: Cultural Propaganda, 1946-1963, was published by the Edwin Mellen Press in 2008. Great article and good to see researchers in the field advertising the work that goes in to producing a blog, article or book! I am just about to begin a PhD on the history of women playing rugby, so if any football fans out there are also rugby fans I would love to hear your stories from across the pond (currently UK based)!